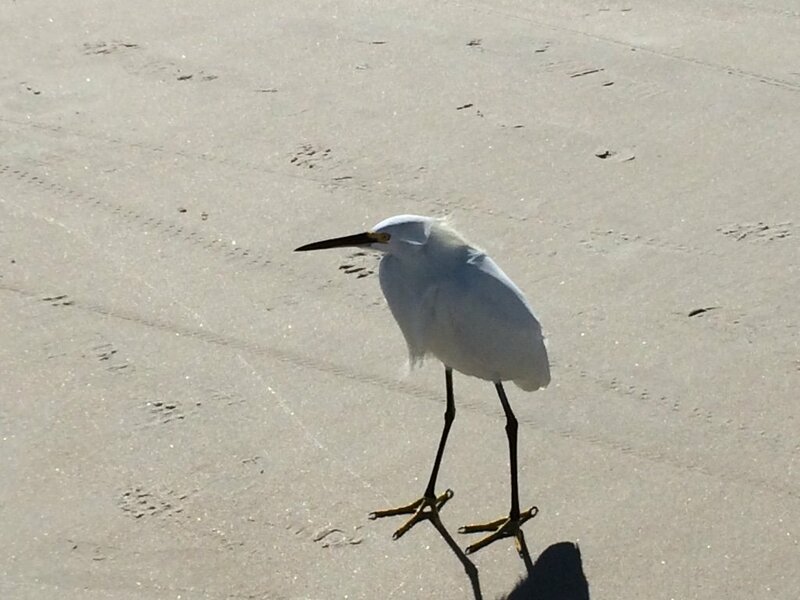 I have been trying to identify this shore bird. I've been seeing it everyday so far from Jan 15 thru today Jan 20 on the beach in Daytona Beach, FL. We've mostly seen it in the morning but also in the afternoon. It's near the water's edge or in it. Doesn't seem to have much fear of humans and likes to hang out near the people fishing (probably thinking they will get a free meal). It's always been alone. It's all white with black legs and yellow feet. At first I though it was a snowy egret, but it's smaller and doesn't have a neck (saw them together so the differences then were quite notable). I found some pics on the internet, but they were labeled as unknown bird. Thanks for the help! 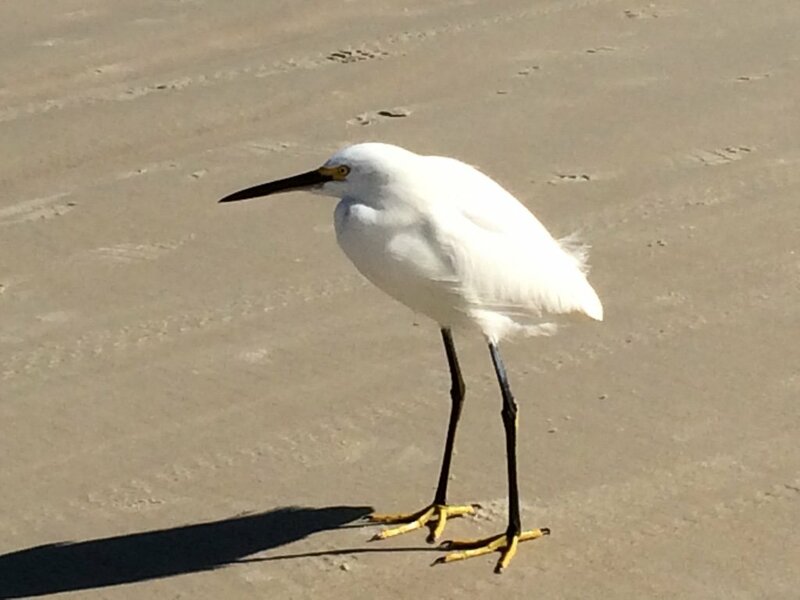 Your initial thought was correct - this is a Snowy Egret. It has pulled its neck against its body, perhaps to keep warm. It was standing next to a snowy egret and it looked smaller. Could it just be a juvenille so that's why it looks smaller? Thanks for the reply! The full black bill and dark on the legs indicate it's an adult. Juveniles often take a while to acquire this appearance. It could simply be phenotypic variability, just like there's a range of sizes among humans, or it could be compacting itself, making it appear smaller than it actually is. 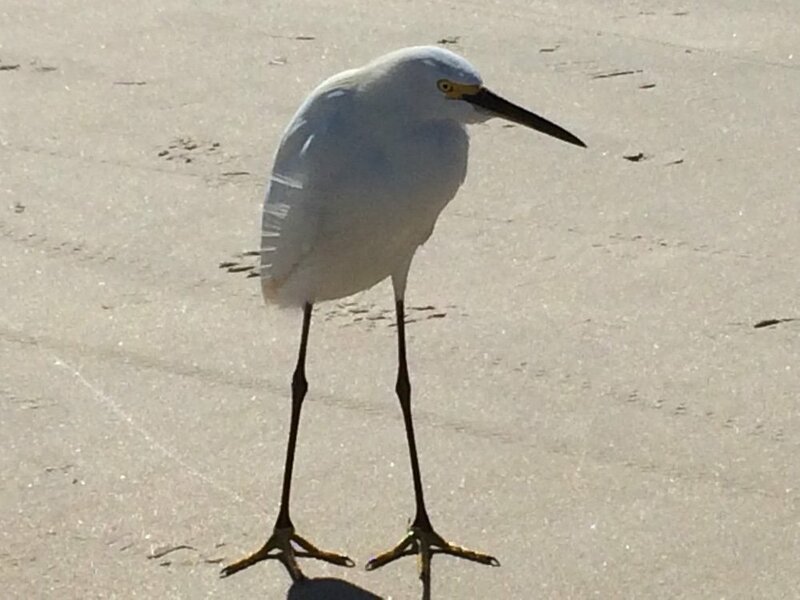 Do you have a photo of the other bird you identified as a snowy egret? This one looks quite typical except that it's neck is not extended. I don't have a photo of the 2 birds together, but I'm here for another week so if I see them together I'll definitely take a photo. It's just weird that every day when I see the bird it's neck has never been extended. That's why I was wondering if in fact it was a snowy egret. Except for the neck though, it sure does look like one. Thanks for the replies! I'm wondering if it might be ill since it seems to be acting strangely. I know my chickens will stay away from the others and keep their necks tucked in and fluff up their feathers when they're sick. I saw the bird again and watched it for a while. It actually did extend its neck twice, so it definitely is a snowy egret. It also let me get fairly close so I was able to check the back of its legs and saw the yellow stripes, so it is a juvenile which is why it seemed smaller. It apparently likes to keep its neck scrunched up unlike other snowy egrets I've seen. I guess birds have quirks just like people.